Recently the new Mental Health and Wellbeing Centre for Moray opened in Elgin. This centre can be used to access a range of adult services designed to promote positive mental health and support people to recover from mental ill health. People seeking advice and support can call or email the service, or visit its newly opened office base at 30-32 Batchen Street in Elgin town centre. 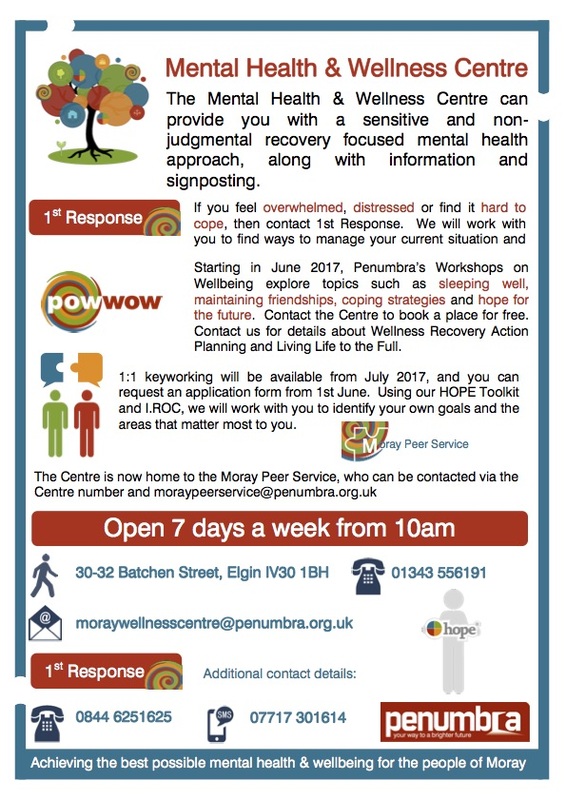 The Centre can be contacted on 01343 556191 (general number) and 0844 6251625 (1st Response service for people in distress) or by emailing moraywellnesscentre@penumbra.org.uk. The Centre will initially provide a service for Elgin residents before service provision is expanded to include all of Moray in April 2018.